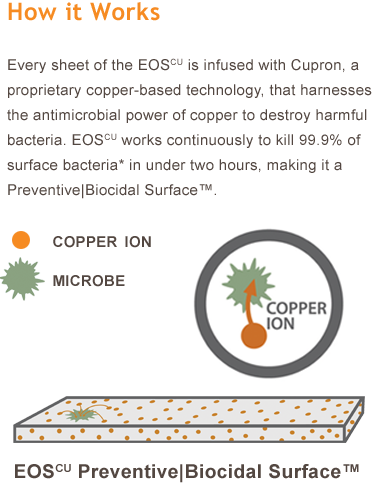 New technology infused the durable EOS Solid Surface with Cupron’s proprietary copper-oxide compound, creating EOScu Preventive|Biocidal Surface™. EOScu is the first EPA-registered synthetic hard surface that continuously kills bacteria,* even after recontamination. 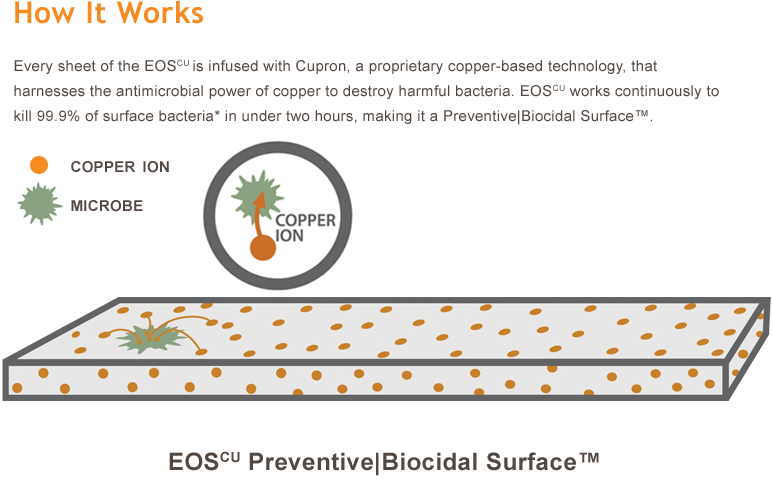 Copper is a known microbial killer. The element eliminates bacteria through ions that damage bacterial cells. Copper is registered with the EPA as a public-health antimicrobial product because of its proven ability to kill bacteria. When bacteria and copper ions come into contact, the copper ions weaken the outer membrane of the bacteria cell through the process of oxidation. 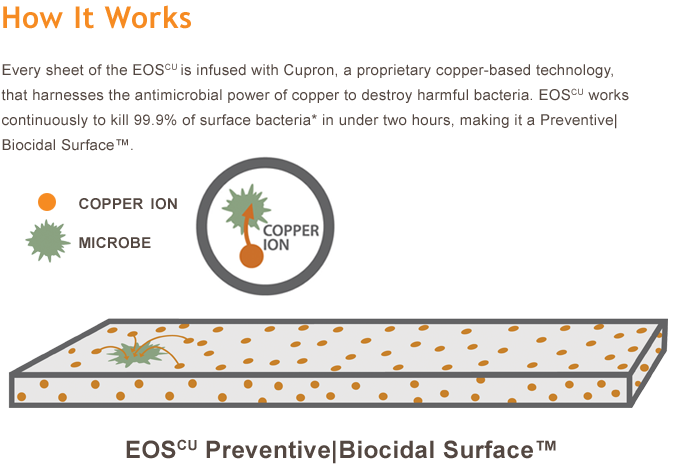 Copper is toxic to the inside of the cell and, eventually, the copper ions cause the cell to rupture. The cell then loses its vital structure, and dies. Copper has multiple pathways to kill bacteria. That makes it more difficult for bacteria to become resistant to its powerful effect. Download this PDF to get more information on how copper kills bacteria. 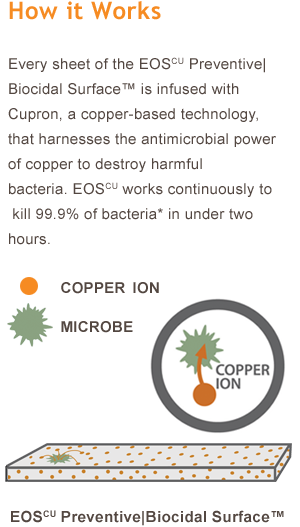 EOScu is infused with Cupron, a proprietary copper technology, harnessing the biocidal power of copper. Together, they create a Preventive|Biocidal Surface™ that continuously kills bacteria and actively reduces the bioburden in clinical environments. If scratched, the abrasions actually increase the effective Preventive|Biocidal Surface™ area. Has a warm, modern design with colors inspired by nature that contribute to the healing environment and do not alter after installation.